The Rocket M900 is a rugged, high-powered 2x2 MIMO radio with enhanced receiver performance. 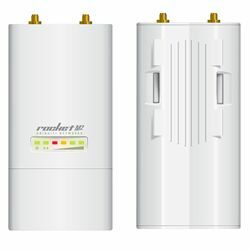 When used with hi-gain directional antennas (sold separately), it provides incredible range (30+ miles) and breakthrough speed (150+ Mbps real TCP/IP). Use it to bring point-to-point or point-to-multipoint wireless signals to a wired network. Installation is simple: just snap it to a compatible antenna and connect an 8P8C plug into the weather-proof compartment. Includes PoE injector and pole-mounting kit. Requires compatible 900MHz antenna, not included. Note: Operation may not be legal in all jurisdictions.